Well, you haven’t heard from me for a while, so here is my account of a very magical week! I am going to write this in the hope that any of you who harbour a secret wish to play for BC can live vicariously through me, and achieve your goal one day. My first Canadian Nationals was AWESOME !!! Never in my wildest dreams did I actually think I would get to play for BC, and then it happened, and I had no idea what a fabulous experience it would be. So many thank you’s and so many superlatives…. here goes ! 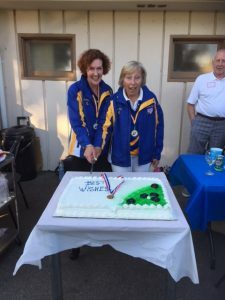 Thank you to Cheryl Young (Stanley Park) for saying ‘what about Sue?’ when Emma Boyd and Laurie Frederiksen (Tsawwassen) were considering entering a team for the Provincial Fours. Thank you to ‘the bowling gods’ for helping us all to play well together for three days at North Van, never having played together before, not even for a practice! ‘They’ also ensured that I never heard we were playing the reigning National Champions in our Provincial final, who had been undefeated at the 2017 Nationals! Playing alongside us Tim Mason’s team, Hiren Bhartu (Nanaimo), Derek Kaufman (Courtenay) and Joe Hunt (Coquitlam) (National Medallists in 2015) also won their Provincial Gold, and it was so exciting to know that we were all going to Regina together. So we were measured up for our shirts and jackets, Cheryl invited our team to join her Stanley Park ‘send off’ BBQ and they were so generous with a mascot, BC corsages, a cake, speeches… it was all beginning to seem real. Everyone arrived at the airport on Monday morning, (Aug 21) and became a squad complete with manager, David Mathie, all wearing the BC jackets and all full of hope. I had never been to Regina before, and Susan Lewis, you were right, its lovely! So much space, and lovely parks, and incredibly welcoming people. Regina Lawn Bowling Club was a spacious venue, across from the Mosaic (home to the Rough Ryders), with four greens and a fairly small clubhouse, and nothing was too much for them. They even planted the flowers in groups of two and four to mirror the event. Buses shuttled us to and fro, and everything: airport, hotel, and bowling club, was within a 5 minute taxi ride. We had a leisurely practice on our first afternoon, went out for dinner, and then there was the official practice session on all four greens on Tuesday, with bowls and shoe inspection, and a gift bag. The banquet was at our hotel, and I liked that every team was introduced. So next day it was real… all the Provinces congregated behind their flags first thing, and as the piper played, we walked around the green in front of the clubhouse, it looked like a human ‘bowling spider’ waiting to happen. It was surreal singing ‘Oh Canada’ alongside bowlers from 9 provinces. Again, I had no idea we had a pretty tough draw for our first day.. but I found out once we started playing. The greens were excellent, very true, hardly any runs, and fast. We lost to Manitoba A, Ontario A and then playing BC B (reigning Champions) we led most of the way only to lose in the last end by one shot. Tim’s team had a rough start as Derek wasn’t well, and David Mathie had to sub for him in their first game. The first two days were really hot… up to 31. As we were now bottom of the standings, our goal for Friday (2nd day) was to win a game. We lost to Sask A, but beat Sask B, thank heavens ! The excitement proved too much and we lost to Manitoba B. By this time the wind had got up, according to the website, there were gale force gusts, and that was a whole new experience. Most of you know that my jack throwing was very dodgy for a long time. Throwing the jack into the wind is really hard work, and having the wind take the jack is challenging too! By now, with one win under our belts we had moved to second from the bottom and had gained a little confidence. Alongside the bowling we were meeting such lovely people… there were old friends who have visited West Van for the Nationals, and the Singles, and we were quickly making new friends. Tim’s team managed two wins that day, and were still in with a chance of making a medal round. On Saturday morning we had another tough game against Alberta A, but we played well. Playing Ontario B was a nightmare for me, and I felt I played like a two year old… I just seemed to lose all the feel. I wasn’t tired, the green was just fine, no excuses… and we lost. I knew we were being streamed for our final game, and as I knew one of the commentators, I suggested they might like to choose another game to film … but no, we played Nova Scotia on the TV rink and we played our best game… ! I mention this as an encouragement. I was exactly the same person, with the same bowls, very similar greens, same team mates, and yet the experience from Game 8 to Game 9 was completely opposite, so as soon as ‘it’ goes, ‘it’ can come back, never give up ! We were all delighted that we ended on a high and won our last game. The guys just missed out of a medal chance, but everyone was well again, and we had all had a fantastic few days. As we were not playing on Sunday, we could now break curfew, and that night’s celebration I will share only to interested parties. On Sunday our BC B Womens Fours (Josephine, Priscilla, Sarina and Gigi) were in the Gold/Silver game (and won GOLD AGAIN), our Mens BC A Pairs (Christie Grahame and Paul Choi) were in the Bronze/4th game, and our BC B Mens Pairs (Paul Lee and Early Luk) were in a tie break game on Sunday morning. It was lovely to wear our BC jackets and cheer them on, through rainy conditions. BC A Mens (3:6) and Womens Fours (2:7) both ended up in 8thplace (out of 10). The medal ceremony and closing ceremony followed, again just awesome. I totally understand now everything that Tim had been saying about the experience. Obviously if we had all played better and got into the last day, that would have been magical, but what do I remember most ? the fun, the lovely people, the friendships, the generosity, the laughter, the warmth of spirit and the encouragement, being looked after so well, feeling part of a team, wearing our jackets everywhere we went, just being part of a National event… there’s nothing to beat it, well apart from playing for Canada as Tim can attest to… but for him too it was about catching up with old friends and just being part of the joy, win or lose. It was interesting to me how much emphasis was put on the social aspect of the event. I know that our social bowlers don’t feel they are competitive, but I suspect they enjoy their winning shots as much as anyone. As a competitive bowler, the more social it is, the more relaxed I am, the better I play. Many of the top bowlers were lamenting the three game for three day format because there wasn’t enough time for them to socialise. So maybe the lawn bowling playing field does not consist of polar opposites after all. Our young skip, Emma, had just won the U18 National Championships the week before, and delivered some incredible shots. In October she is off to the North American Challenge, where Canada plays the USA. Laurie (playing Vice) overcame her dislike of travelling and saved our bacon on several occasions, Cheryl and I soaked in every moment of the up and down ride, and we are now determined to be at another National event one day. The Rough Ryders beat BC that weekend, and Brooke Henderson won the LPGA in Regina… it was all happening. So if you got to the end of this, well done, and good night from a very tired and very grateful first National bowler… and finally one massive thank you to Tim for looking after us all so well !